Review of Canada, the Congo Crisis, and UN Peacekeeping, 1960-64. Kevin A. Spooner. Canada, the Congo Crisis, and UN Peacekeeping, 1960-64. Vancouver: UBC Press, 2009. Notes prepared for Prime Minister John Diefenbaker’s attendance at a Commonwealth conference in March 1961 summed up Canada’s position on Africa, noting that Canada had “no territories in Africa and no territorial ambitions. It has no financial or commercial interests in the Congo sufficient to influence its judgment. Canada – as anyone may verify by examining our record on this issue in the United Nations – has been and remains, relatively speaking, impartial” (p.148). So, how did Canada end up with blue berets in the Congo? The Opération des Nations Unies au Congo (ONUC) was created as a United Nations peacekeeping mission in the summer of 1960 as the Congo went through the enormously difficult process of decolonization from Belgium. Soon after being granted independence mutinies broke out and civil war followed, Belgian troops continued to interfere, and the province of Katanga declared its independence. Over the next four years, ONUC broke new ground given the ongoing internal crisis, the inability to achieve accepted political settlements, the secession of part of the country, the Cold War context, and issues with financing, making ONUC, in the words of one scholar, “a watershed in the development of international peacekeeping” (p.5). 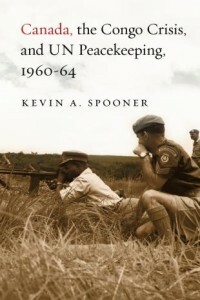 Essentially, it is Canada’s political, diplomatic, and military response to the Congo crisis that forms the core of Kevin Spooner’s Canada, the Crisis, and UN Peacekeeping, 1960-64 (UBC Press, 2009, paperback $32.95). The Canadian response, undertaken primarily under Diefenbaker’s leadership, provides “a useful historical case study” dealing with the contemporary issues of “peacekeeping, multilateralism, Canadian-American-British relations, middlepowership, [and] quiet diplomacy” (p.2). At the same time, Canada’s reaction, in Spooner’s opinion, “reveals a more reasoned and effective response” (p.2) than is typically accorded to Diefenbaker’s other foreign policy dealings. The author examines Canadian foreign policy during the Congo crisis and Canadian involvement in ONUC in a chronological framework dealing with various themes including decolonization, the Cold War, ONUC’s changing mandate (particularly concerning the use of force), the Canadian government’s internal discussions of peacekeeping policy, and the larger reasons Canada was involved. Spooner brings a great amount of detail and discussion to light and in a manner which deals with some issues conclusively and admits that there is still room for debate and further research in others. Spooner leads the reader through the immediate background of the Congo crisis and the decisions which led to the deployment of the UN force. As for Canada, before 1960 its “interest in Africa was modest at best” (p.11), although when the opportunity arose Canada did take notice. Canada’s participation in ONUC – certainly no sure thing when the crisis began – is covered by the author through the use of documentary sources and, interestingly, through media coverage and through the views of ordinary Canadians. In hindsight, it almost seems inevitable that Canada – a modern, bilingual, and Western nation would be part of ONUC. However, the debate within the Canadian political and military establishment, and the slow steps and limited military deployment provide for some very interesting insights and arguments. Spooner’s coverage of the initial deployments of ONUC – the Canadians included – reinforces the difficulties suffered by the UN, the rigid Cold War context, and the underlying political instability in the Congo. Nevertheless, it also slowly revealed an opportunity for Canada to act as a “bridge” as, through “quiet diplomacy, it seems, Canada hoped to rise above its geopolitical position to facilitate communication between blocs of nations” (p.99). However, the Canadian government would struggle throughout ONUC to attempt to balance its position between “ally” and “mediator”. As the situation within the Congo worsened in 1961 – including the abduction or detention (and occasional killing or wounding) of UN peacekeepers – the ONUC mission came under further assault. Spooner provides an extensive examination of how this affected Canadian foreign relations with respect to the military’s status on the mission, ongoing Soviet accusations against the West, and Canada’s diplomatic position (including its worsening relations with NATO partner Belgium). This entire situation became even more difficult for the Canadian government when UN forces undertook military operations at the end of 1962, thus raising questions about ONUC’s impartiality in the face of the ongoing internal Congolese political divisions and leading to further disagreements amongst Western nations as to what the immediate future of ONUC entailed. When the Canadian military departed the Congo in July 1964, more than 1,800 officers and men had carried out numerous types of duties, particularly communications, command, and air transport. Why was Canada in the Congo? In the words of the author, Canadians “would do well to remember that foreign policy is ultimately driven less by altruism and more by concrete, realistic objectives and considerations” (p.215). Spooner argues that Canada was part of ONUC more because it served Canadian interests (to support the UN and the principle of peacekeeping) than because of some sense of Canada as the altruistic international peacekeeper. Criticisms of this book are certainly few. At times it was difficult to keep track of all the people involved, probably unavoidable given the scope of the work, but an appendix of the major players may have helped. In addition, the coverage of the 1963-64 period felt rushed compared to the 1960-62 chapters. Although it was clear that 1963-64 mostly revolved around training programmes and the withdrawal of ONUC, it felt somewhat like the overview of those years was abbreviated by the historian’s knowledge of what the end result would be. This is an important work in the diplomatic, political, and military scholarship of Canadian peacekeeping. Works on the individual peacekeeping missions in which the Canadian military has served are still relatively scarce, partly due to still-classified archival documentation and the “nearness” of the subject matter. However, this does not appear to be a particular hindrance for the history of ONUC. Kevin Spooner has researched and written an excellent overview of the mission, the Canadian involvement in it, and the immense difficulties that faced the Canadian government at the time. Ken Reynolds lives and works in Ottawa, Ontario, as an historian with the Department of National Defence. He has degrees in history from Trent and McGill Universities.